Great fight scenes and diverse martial arts made for some real entertaining moments. Thankfully, there was minimal CGI and the highly stylized fight scenes were a ton of fun to watch. Yuen Woo-Ping, a master of martial arts choreography, makes his directorial come-back in the fantastical tale of revenge True Legend, which Indomina Releasing acquired after it screened at Fantastic Fest last year. True Legend will have a limited theatrical release on May 13th, and packs some faster-than-possible punches. The martial arts choreography is as sleek and stylized as any fan of the genre could wish, and though the sometimes silly story went on far too long, the film was still a great showcase for Woo-Ping’s action artistry. Austin’s fast-growing genre film festival Fantastic Fest saw a deluge of martial arts entries last year. Director/choreographer Woo-Ping’s Snake in Eagle’s Shadow and True Legend both screened, and Woo-Ping was honored with a Lifetime Achievement Award. Woo-Ping is responsible for choreographing the awesome fight scenes in films like The Matrix Trilogy, Kill Bill, Crouching Tiger, Hidden Dragon and Hero. True Legend marks his return to directing, as it has been over a decade since his last directorial project, Iron Monkey 2. Then the film jumps right into the fighting with a massive battle between warring factions. Su Can (Vincent Zhao) is a great Qing Dynasty general, and the movie opens with his rescue from an enemy encampment. Everyone loves Su Can. He’s not only a great warrior, he’s humble and kind. When he’s offered a governorship, he wants to give it to his adopted brother Yuan (who nobody really likes). Instead, Su Can wishes to open a school and teach the Wushu philosophy, hoping to one day become a Wushu master and understand the meaning of life. Su Can has a loving wife named Ying (Zhou Xun) , and a young son. He leaves his military life and becomes a Wushu teacher, living a peaceful existence. Everything changes when his crazy adopted brother Yuan (Andy On) comes for a visit. Yuan’s father was killed by Su Can’s father, and afterward Su Can’s father adopted Yuan as his own child. But Yuan has never forgiven Su Can or is father. So when Yuan gets the powerful position of governor, and perfects the Five Venom Fists technique, he comes for vengeance. Yuan kills Su can’s father, and takes Ying and their young son into custody. In one of those one-man-against-an-army scenes, Su Can fights his way into Yuan’s lair and they battle it out. Only Yuan has made some personal improvements on top of his Five Venom Fists technique; he’s had black body armor attached to his skin so it’s like a scorpion’s hide. With the venom of his fists, Yuan poisons Su Can and throws him into the racing river. Ying hurls herself after her husband, but their young son remains in Yuan’s clutches. A mountain healer (Michelle Yeoh in a very small role) takes Su Can and his wife in. She takes the poison out of Su Can, but Su Can’s arm is ruined and he has given up hope. As the months and years go by, Su Can finds hope and begins to practice his martial arts again with the help and guidance of the God of Wushu and an old sage. His wife thinks he’s going mad, because only he can see the God of Wushu. As time goes on his arm returns to full strength, and he is ready to go reclaim his son and wreak vengeance on Yuan. This synopsis could really go on for some time more. Let’s just say he gets his son, loses his wife, becomes a drunken beggar, meets the God of Wushu again disguised as another drunken beggar and is taught a new fighting art, Drunken Fist. With this new fighting technique he takes on a corrupt gaming arena run by some decadent, evil Americans (hmmm, some message there?). After he defeats them all in the arena he goes forth and wanders the world with his son, looking for the meaning of life through the Drunken Fist philosophy. 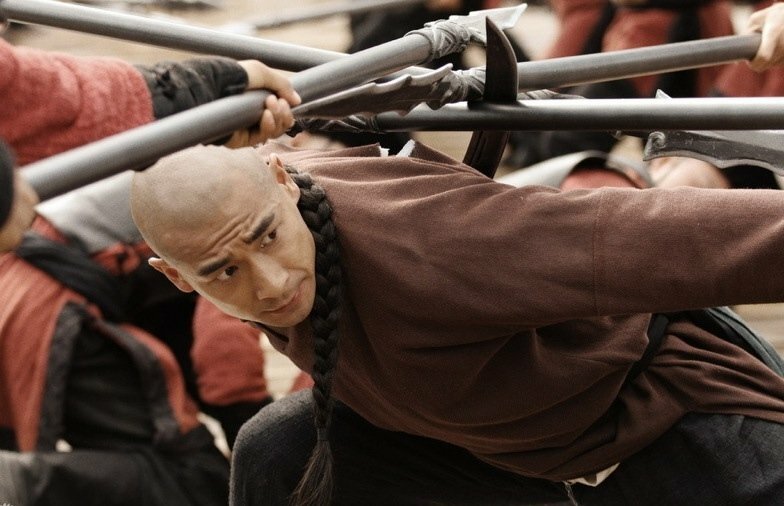 Much like Crouching Tiger and other films in this genre, there’s plenty of highly stylized fight scenes in True Legend. The first battle scene of the movie opens with extreme sword fighting complete with sparks flying off the blades and blood spattering. There is some running on walls and aerial stuff, too, and slow motion moments. Woo-Ping no doubt had plenty of influence in the choreography, but his skill behind the camera is apparent as well; the extreme/intriguing camera angles during the fights, and the artistry behind the scene compositions. Weapons of all kinds were showcased, as well as a myriad of fighting techniques (MMA, knife combat, Drunken Fist). Zhao plays the hero with a great humor. He’s a warrior, but he’s accessible. Xun portrayed Ying with a sweet earnestness that made her character jump off the screen. Though she didn’t have any fight scenes at all (didn’t even throw a slap), and her character was bullied a lot, she still didn’t come across as weak. The film’s villain was a scene stealer. Andy On played Su Can’s nemesis with a subtle sneering that made him imminently despisable, but also threatening. The cool practical effects of his scorpion skin armor just enhanced his menace. David Carradine even made an appearance toward the end of the film as the ruthless fighting boss, though Carradine’s decrepitude made the character a little lackluster. The film had a mythic feel that made the ridiculousness of the story digestible. The costuming intrigued with bright colors at one turn, and simple rags that seemed to flow like water at another. The music was classically epic when needed and minimalist too, but mostly it got lost in the action. I found the musical scores of Hero and Crouching Tiger more compelling than that of True Legend. One of the biggest problems with this film, besides the inherent silliness, is the length. It contains two separate films in one. The first story arc follows Su Can as he is cast out, regains strength and mastery of Wushu, and has his revenge. Just when you think the film is finished, the old parchment comes out and says “Drunken Fist,” and then begins a whole separate story arc. I mean, Su Can is still the main character, but the atmosphere is different and the fighting technique has changed, and it simply begins to drag. Screen writer Chi-Long To might have melded the two story arcs into one for a more cohesive film (and one that didn‘t start dragging). If True Legend had ended with Su Can’s revenge on Yuan and the death of Ying, I would have had only a few negative things to say about it. While establishing a legend may be hard on film, believability doesn’t become too much of a detractor here. As with many films in this genre, the fantastical elements and the silly story are more a vehicle for the awesome martial arts, so forgivable. 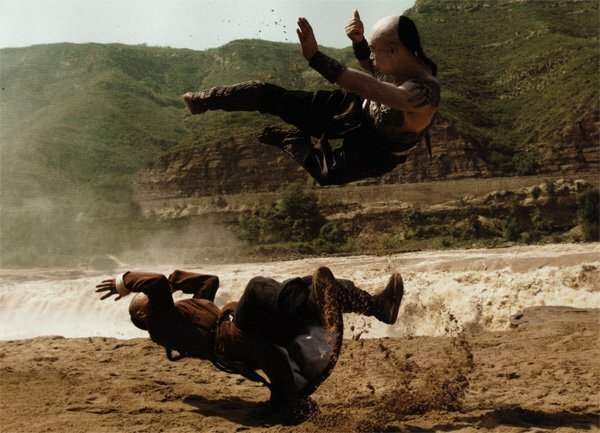 Woo-Ping brings audiences some dynamic, over-the-top action/martial arts sequences. Story-wise the film falters some, but it’s still worth a watch for fans of the genre. And on an aside, I think this genre of film much more fun and irreverent than the austere, plodding films of the Samurai genre.